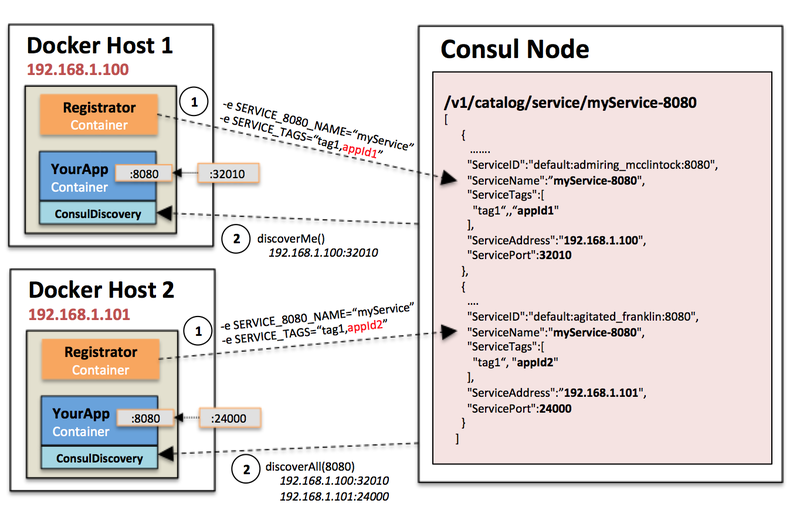 Does your containerized app have the need to discover both its own IP and one or more mapped ports? How can another container access my exposed ports and how can I do the same of my peers? As it stands today, simple self discovery of your container’s accessible IP and one or more of its mapped ports is not exposed to your Docker container process as a native feature of the engine itself. If you’ve attempted to containerize an app that attempts to discover its peers in order to form its own peer-level cluster etc, you’ve likely run into this challenge. That said there are several tools out there with can help you with this issue. One of which is Registrator which is a special container that listens for events from a Docker host and acts as service discovery bridge that relays this info into other tooling such as Consul and etcd etc. In short, when your container is launched, the Registrator container collects all the info about the docker host it is running on and its exposed ports and registers this under a named service in one of the aforementioned backends. This is all fine and great, however this still puts a lot of work on you, the container developer who needs to collect this info and then act upon it in order to form a higher level cluster between your containers. The purpose of this library is for “self-discovery” from within your JVM based Docker application where you need to discover what your accessible docker-host bound IP and mapped port(s) are, as well as your peers within the same service. As noted above this is critical if your container has to do further peer discovery for other services it provides or clustering groups it must form.